Have you created your characters? What's your hero's internal conflict like? What's your hero's external conflict like? Are both the internal and external conflicts affecting each other? What impacts do both the internal and external conflicts have on the hero, the villain, and their adherents? Do you have effective support for your hero? How will the hero finally overcome the villain? Do you have thrilling moments that can excite the audience? Did you create an 'ending' that can never be forgotten so easily? Have you organized your story? Have you given your characters the best look? Do you need to shorten or increase the length of the story in order to get a short or long screenplay? Are you ready to write now? Once you can show/provide positive answers to all the questions above, you are already having a screenplay. Now, below, let's analyze how you can build answers to the questions. 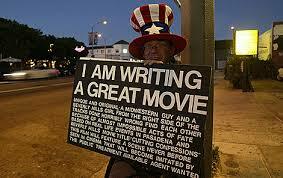 It will help you plan and write your screenplay. Develop a beautiful story. A story that arouses the different feelings of its audience is a beautiful story. A beautiful story is a story which is rare, mysterious, incredible yet convincing, touching, culture diverse and multidimensional. so it can stand out from the rest, and that will make it a beautiful story. A raw idea is that idea only you can generate if you search your heart very well. It's a result of all the experiences you encounter in you daily life. In the course of all the other steps below, your characters (the hero, the villain, the supporting characters and the rest) would have created themselves. All you would need to do at the end is to refine them and give them the qualities and characteristics that would best suit the story and the screenplay. The internal conflicts are for the supposed hero/the main character. (Remember the characters have not been fully created. The proposals being put up are just tentative for now). External conflict is the main bone of contention in a story. This is where the thrills and impact of a movie lies. It is the main fight/competition between the hero and the villain. External conflict is the heart of the story or movie. It is what holds down an audience. Once the external conflict is described to an audience, their understanding and interest about the story or movie is affected. A movie is thrilling and entertaining once it has a two or three group in competition for a course. This competition is the external. An audience, in order to ascertain what the thrills of a movie is like, they ask questions such as: What's the matter? What's the contention? What are they fighting for? What's at stake? Once a writer can answer these questions, the external conflict in his story is established. The internal should affect the external and vice versa. Let the internal always thwart the fight against the external. Also let the fight against the external help expose the existence of the internal. Again, let the external when fought and conquered help solve completely the internal, and vice versa. With an illustration, it's just like in a situation where a well grown brilliant coward thought he could use his intelligence to outwit and eliminate his fathers greatest enemy, but little did he know that the enemy was as brilliant as he is. The only remedy was bravery after it was discovered that the enemy too was a weakling when it comes to real physical fight. The well grown man is a coward, so in order to win the enemy whom is a weakling, he must get back home and pick up some courage. To analyse this, the grown man's internal conflict is cowardice. And again, he didn't know cowardice could thwart his fight against a villain. When it was discovered that the villain is also as intelligent as he is, he had to find another means of fighting him - and that's real face-to-face fight. He needs some courage to engage in this fight, thus he had to first of all settle his internal conflict - cowardice. So after he would have conquered the enemy, his internal problem, cowardice would have been checked. This is how internal and external conflicts depend on each other. The hero's lovely people and supporters, as well as those of the villain must feel the pains and gains of the ongoing conflicts; as the case may be. supporting characters. They are a very important friend to the hero, and they are the ones who may guide the hero to conquer the villain. Apart from the hero having a guide, a counsellor, or putting a check to his internal conflicts, there should be a means either tactically designed or by a divine intervention through which he will finally escape or defeat the villain. This is the turning point, that final moments the hero makes the courageous moves, after he has solved his internal conflicts and counselled by his counsellor, to defend, escape and conquer the villain. Moments after moments, that's how a scene goes by. And scene after scene, that's how a story goes by. What makes an audience love a story is the exciting moments therein. To develop exciting moments, let every dialogues and actions by the characters take the audience by surprise. (i) Install your theme properly. The theme is the message has to send to the audience. There must be a defined setting. By now, the whole characters would have been created based on the story build-up so far. Now they need to be refined and redesigned to fit in properly. To do this, take time and point out all the characters you encountered as you were observing all those procedures above. Write them out and identify all the roles they played in the course of the procedures. This will help you finetune their monologues and dialogues, recreate the behaviours and restructure their physical make-up. It's very easy to keep your story at a particular desired length. All you need to do is to adjust the frequency of events, the time it will take a particular course to be achieved, the number of characters, number of actions and the different dimensions involved in each of the points already listed above. Before arriving at this point, you would have scribbled some things down. Now put those things together and create a content. Make it your screenplay in prose form. And make it sequential; let it have a well defined beginning and a befitting ending. Start writing your screenplay now! You are now free and qualified to write your screenplay. It's going to be very easy now. The only thing is just to get the format for a screenplay and start building your own screen from the prose you've created. The format is based on writing the screenplay using the proper formating guidelines of the elements of screenplay. See the elements of a screenplay and their formating below. Read more on formating scene heading here. (i) Write the actions as they should appear on tv screen. This means your verbs must be in present tense. (v) All actions must be written in real time as they occur. (vi) Avoid using indirect descriptions, figurative expressions, phrasal verbs. Just be go straight to the point. Read more on formating character name here. Read more on formating dialogue here. Formating:- S.O. directly to the right of character name. Formating:- left margin is 6.5. Read more on formating transition here. Read more on formating shots here. Read more on formating adlibs here. Read more on formating montages here. Read more on formating poetry, lyrics, rhymes here. Read more on formating intercuts here. Read more on formating flashbacks here. You can read more generally on how to format a screenplay here.